Teams of KEP lift engineers work across the country, below is just a small selection of our most recent works. To keep up to date with our company news and achievements, please follow us on social media - click on the relevant icons below. SB200 is a vertical platform lift assembled using high quality materials and designed to meet the characteristics of ultimate performance and outstanding aesthetics. Passengers are lifted by the platform inside the shaft which is constructed of special multi-layer aluminium sandwich type panels or glass panels. The platform is moving at a maximum speed of 0.15 m/s. Every trip starts and ends with exceptional smoothness. The platform, the control panel and its buttons are adapted to be used by any category of passengers, including wheelchair users and the visually impaired. A screw driven system ensures durability and the highest level of security compared to other types of drives used in similar platform lifts. Platform control system supports up to 6 stops and 3 doors at each stop. SB200 has a standard load capacity of 400 kg and a travel height of 13 meters. SB200 is designed according to the Machinery Directive 2006/42/EC and complies with the European platform lifts standard EN81-41:2010. The operation principle of SB200 is based on the screw self-locking gear. The engine is mounted on the platform itself and rotates a threaded nut, which moves along the stationary screw, this way lifting the platform. The shaft is constructed on the basis of an anodized aluminium frame interconnected with the panels of a client’s choice. Multi-layered sandwich panels and laminated glass panels come as a standard. A maximum of three doors may be installed on each floor with either left or right swing. The doors on the top floor stop may be designed in the form of gates. This type of construction looks aesthetic and modern and gives a clear view of the surroundings. At the request of the client, the platform and panels may be painted in any RAL scale colour. SB200 is a standard colour RAL9006 (white aluminium). SB200 is designed for a comfortable use by all categories of passengers, including the elderly and people with limited mobility. 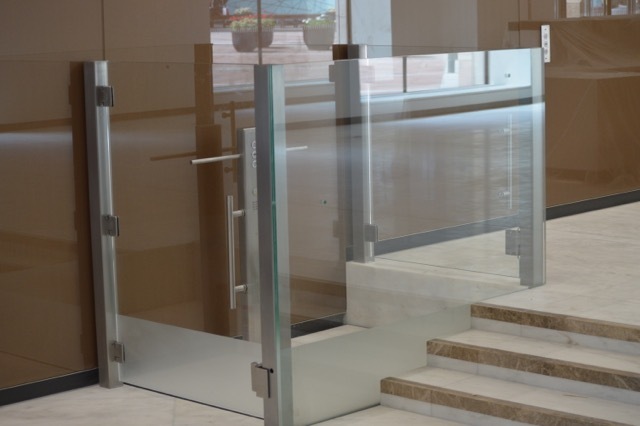 Our platform lift fits perfectly both in the interior of buildings, and in a variety of external architectural styles even, in some cases, improving the aesthetics of buildings. In the case of internal installation, SB200 has all the essential qualities of a platform lift: minimum overall dimensions, no pit and machine room, silent operation and low energy consumption. SB200 may be installed in libraries, museums, hospitals, schools, airports, railway stations, aboveground and underground passages or parking. Our lifts are widely used in private houses, cottages and apartment buildings. SB200 is durable and unpretentious in service, adaptable to different standards of power sources and can withstand large power surges. The absence of the lift cabin in SB200 lets us make a spacious and light platform. A standard platform (1,485 x 1,070 mm) ensures a comfortable journey for a person with a wheelchair and his attendant. The control of the platform is very simple and intuitive, with a stable system to incorrect commands or its consequences. A passenger may stop and resume the movement at any time of the trip and even change the lift’s moving direction. The beginning and the ending of the lifting process are performed in very smooth easing algorithms and don’t evoke any uncomfortable feelings for sensitive people. A uniformly backlit control panel, with a comfortable handle below, contains large buttons with embossed symbols at a convenient height for access from sitting or standing positions. We use the latest LED technology for the lighting of SB200 as it is cost-effective, durable and has a wide palette range. The sets of a large number of LED elements provide uniform illumination and an excellent aesthetic appearance. Energy saving LED lighting may stay on for a long time even in case of an emergency power failure. A backup battery installed on the platform may keep the necessary level of lighting for a couple of hours. The platform floor cover is made of rough anti-skid material, which is highly adhesive and abrasion resistant. The floor coating material may contain logos, promotional materials or pictures according to our clients’ needs. The vertical platform lift SB200 combines time-tested design solutions and new approaches to electronic control and fault diagnosis. By using the highest quality materials and components, our task is to increase the longevity of the lift and to minimize the downtime associated with troubleshooting and maintenance. The elevator control system can be equipped with a special diagnostic module that provides the detailed information on the status of all platform nodes and system sensors. The module informs about the usage of SB200, including the number of lifts and trip distances. It also enables the performing and adjustments of the lift operating settings, including speed and smoothness, the height of stops, lock closing time, button modes and much more. With the sufficient expertise of staff a computer may be used instead of a module to implement the modifications and even reprogram the system completely. The maximum efficiency of SB200 is achieved by using lighter materials, power saving lighting technologies and selecting a specific electric drive. The electric drive of the lift is constructed on the basis of an electronic frequency converter, which has the best characteristics of power consumption compared to directly connected motors, and enables the adjustment of the speed and smoothness of movement. SB200 lifts come with either a three-phase or single-phase frequency converter, depending on the capabilities of the present electrical circuit and intensiveness of lift usage. The frequency converter always provides the engine with the most optimal energy supply and prevents any energy wastage at the same time adapting to the grid voltage drops. In case of emergency situations the lift mechanism is supplied with a manual emergency descent. Optionally, the emergency lowering mechanism may be actuated by an electric motor with a backup battery. If you have any questions about the SB200 or any other lift in the range, please feel free to contact us. We are proud to announce the RB150 is, an open platform lift! RB150 is specially designed for applications with little or no alterations to existing buildings. 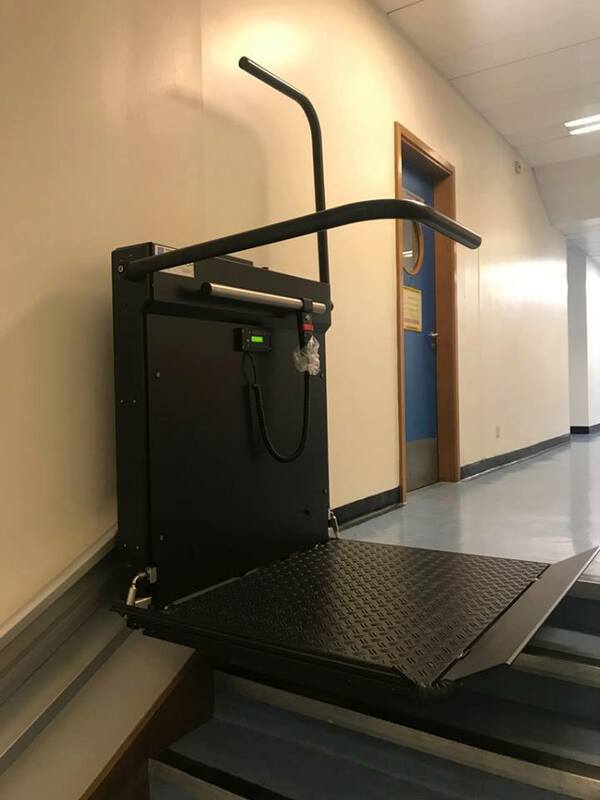 RB150 is an Open Platform Lift (also known as Low Rise Platform Lift or Wheelchair Lift), which provides internal or external vertical travel up to 3 meters. 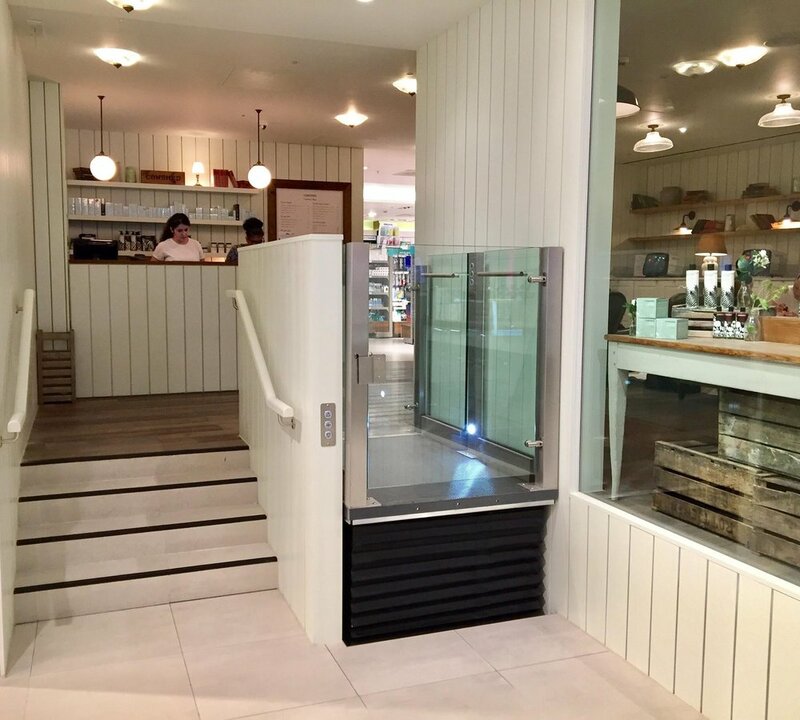 Our Wheelchair Lift can accommodate changes in level from 600 mm up to 3000 mm in commercial and domestic environments and is appropriate alternative solution to a fully enclosed platform lift. RB150 specifically designed for applications with little or no alterations to existing buildings. The open type design offers an aesthetically pleasing solution with brushed stainless steel finish as option. The lift provides a safe and easy way to gain access to a property where stairs would otherwise prevent wheelchair access. It is designed to give customers choice and flexibility. 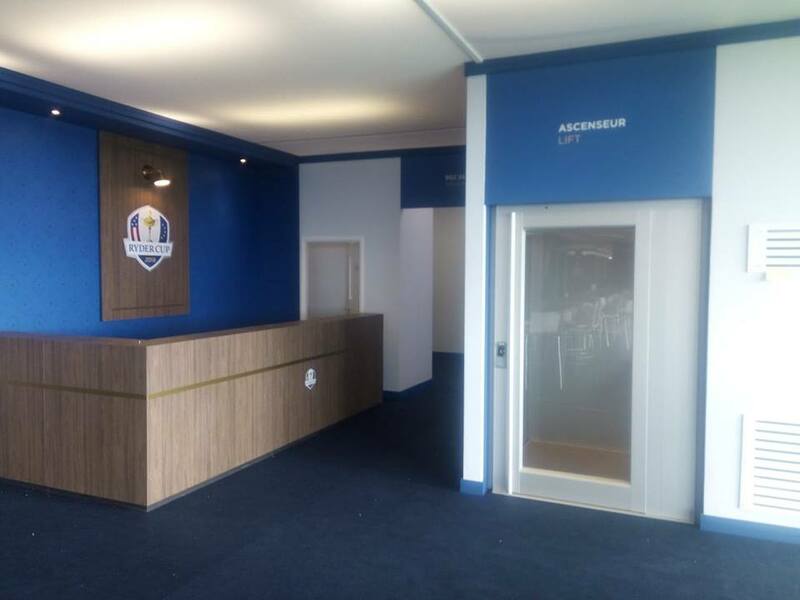 We installed multiple RB150 platforms at The Ryder Cup. A fast installation time and complete reliability during the event made the RB150 a perfect choice! For more information or to have any queries answered, please feel free to contact us. We are excited to announce the introduction of the AB300 to our product range! The operation principle of AB300 is based on the double belt system. The engine is mounted on the top of the guides and rotates a belts, this way lifting the platform. The shaft is constructed on the basis of an anodized aluminium frame interconnected with the panels of a client’s choice. Multi-layered sandwich panels and laminated glass panels come as a standard. A maximum of three doors may be installed on each floor with either left or right swing. The doors on the top floor stop may be designed in the form of gates. This type of construction looks aesthetic and modern and gives a clear view of the surroundings. At the request of the client, the platform and panels may be painted in any RAL scale colour. AB300 is a standard colour RAL9006 (white aluminium). AB300 is designed for a comfortable use by all categories of passengers, including the elderly and people with limited mobility. 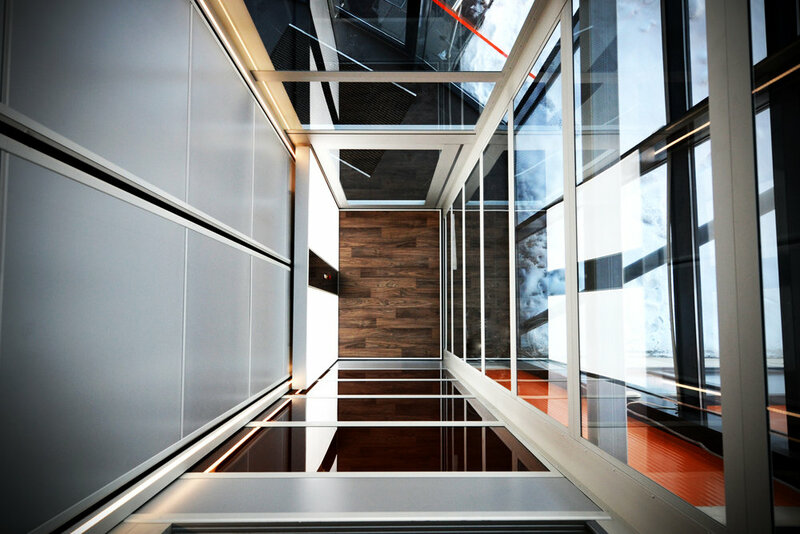 Our platform lift fits perfectly both in the interior of buildings, and in a variety of external architectural styles even, in some cases, improving the aesthetics of buildings. In the case of internal installation, AB300 has all the essential qualities of a platform lift: minimum overall dimensions, no pit and machine room, silent operation and low energy consumption. AB300 may be installed in libraries, museums, hospitals, schools, airports, railway stations, above ground and underground passages or parking. Our lifts are widely used in private houses, cottages and apartment buildings. AB300 is durable and unpretentious in service, adaptable to different standards of power sources and can withstand large power surges. The absence of the lift cabin in AB300 lets us make a spacious and light platform. A standard platform (1,485 x 1,070 mm) ensures a comfortable journey for a person with a wheelchair and his attendant. The control of the platform is very simple and intuitive, with a stable system to incorrect commands or its consequences. A passenger may stop and resume the movement at any time of the trip and even change the lift’s moving direction. The beginning and the ending of the lifting process are performed in very smooth easing algorithms and don’t evoke any uncomfortable feelings for sensitive people. A uniformly back light control panel, with a comfortable handle below, contains large buttons with embossed symbols at a convenient height for access from sitting or standing positions. The vertical platform lift AB300 combines time-tested design solutions and new approaches to electronic control and fault diagnosis. By using the highest quality materials and components, our task is to increase the longevity of the lift and to minimize the downtime associated with troubleshooting and maintenance. The elevator control system can be equipped with a special diagnostic module that provides the detailed information on the status of all platform nodes and system sensors. The module informs about the usage of AB300, including the number of lifts and trip distances. It also enables the performing and adjustments of the lift operating settings, including speed and smoothness, the height of stops, lock closing time, button modes and much more. The maximum efficiency of AB300 is achieved by using lighter materials, power saving lighting technologies and selecting a specific electric drive. The electric drive of the lift is constructed on the basis of an electronic frequency converter, which has the best characteristics of power consumption compared to directly connected motors, and enables the adjustment of the speed and smoothness of movement. AB300 lifts come with either a three-phase or single-phase frequency converter, depending on the capabilities of the present electrical circuit and intensiveness of lift usage. The frequency converter always provides the engine with the most optimal energy supply and prevents any energy wastage at the same time adapting to the grid voltage drops. Electromechanical brake on the guides, executed by patented technology. Configuration of the doors: Opens from left or right side, up to 3 doors per floor. Shaft walls: Steel or tempered glass panels. *For other dimensions please contact our consultant. KEP Lifts engineers are experiences in the repair and maintenance of Wessex platform lifts. Wessex are a British lift manufacturers founded in 1976 that are extremely commonplace throughout the UK. KEP Lifts engineers can carry out your servicing or repair requirements. Should you require any further information, please feel free to contact us today. Please see below for a collection of other brands of platform lifts. To find the best lift for you, please contact us for more information. RB150 is a belt driven lift part of the Barduva range - quietest platform lift we know off on the market. No pit required and the installation can be completed in under a day. Good value, Reliable and silent. Contact us on info@keplifts.co.uk for more information on the RB150. SB200 is a screw driven lift also part of the Barduva range. While better value than some other brands - its quality is the best we have seen when it comes to screw driven platform lifts. KEP Lifts have installed many around the country - they have a good record of being reliable and low maintenance. KEP Lifts is a leading installer of lifts for temporary structures - The range of lifts we use reflect this. They are reliable, quick to install, require far less building works than other forms of lifts and they look the part on these world stage events! These qualities also makes them ideal for your home or business. See below for pictures of lifts from the Barduva Range. Kent Elevators & Platforms - Summer 2018! Summer 2018 is KEP lifts busiest period to date - prestigious events such as Royal Ascot are currently underway with projects in the Ryder cup, Paris to come shortly - watch this space for our latest news. here is a few examples of recent jobs undertaken by KEP Lifts - for more information about any of the examples below; please feel free to contact us. To the right is an NTD lift worked on by KEP Lifts engineers. This platform is known as a 'screw' lift due to the fact the lift runs up and down a screw from a nut driven by the lift car. 'Screw' lifts are often the cheapest type of vertical platform lift with all the advantages of a platform lifts. This type of lift is best suited for areas of occasional use. Heavy traffic areas could benifit from a hrdraulic lift. KEP Lifts are proud to have worked in a large number of famous sporting venues around the country. Currently we have several teams of engineers working in a premier league football team based in London. Works include the installation of a large 'scissor' platform lift. Scissor lifts are an ideal form of lift to be used on a number of functions - whether this be for a goods lift, disabled access lift or even a car lift. KEP works closely with the market leading brand - ensuring quality and reliability at a competitive price. We have many images of scissor lifts below; should you have any questions - do feel free to ask. KEP lifts is a leading company within the UK for installing platform lifts in historic buildings. KEP Lifts have worked in some of the most iconic buildings across the UK - many of which are of historic and cultural importance. Below are just but a few examples of lifts installed within a historic buildings in 2018. Fordwich - Britain's smallest town. In our minds also one of the most picturesque. The town hall is the smallest and oldest still in use to this day. Built in 1544 during the reign of Henry VIII this building has survived and has now for the first time been made accessible to disabled visitors. KEP Lifts carried out an installation of a mylyft scissor platform lift to provide disabled external access to the town hall. Open aspect platform lifts are an ideal solution to providing safe and reliable access from distances of several steps to several metres. 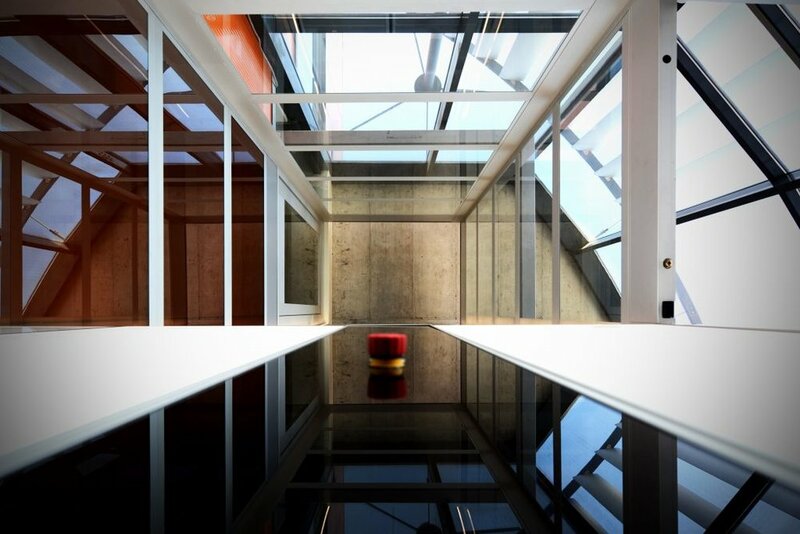 For more information on Open aspect Platform lifts - please visit our platform lifts page. Originating from 678 or 679 Gloucester cathedral has stood proud over the city for many years. This historic and impressive building now houses two new mylyft open platform lifts. Located just east of Chichester is a stunning church dating back to the early twelfth century. 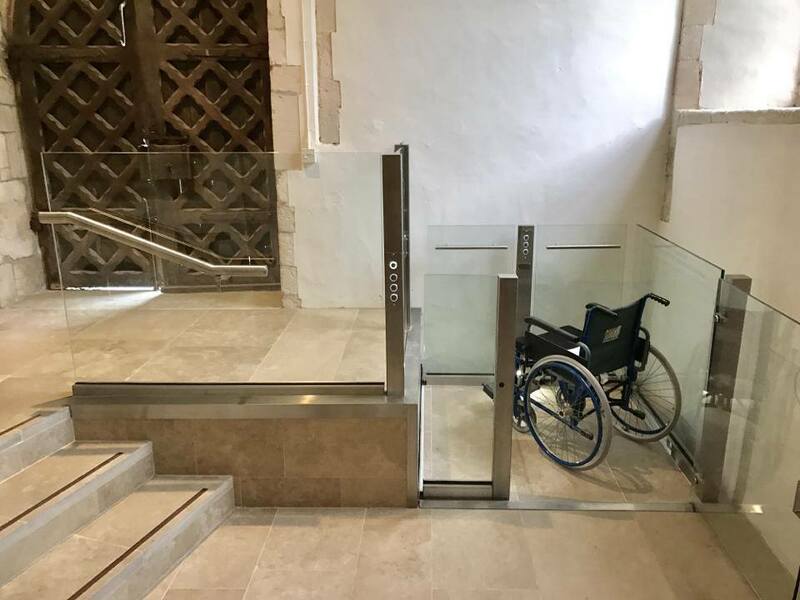 KEP lifts installed a mylyft platform in the churches entrance - providing new disabled access to all of its visitors. As with any historic building - the design of this lift has been carefully considered to compliment and not take away from the building itself. The churches painted ceilings, surrounding ruins and local landscape makes this church a must see in the eyes of us all here at KEP Lifts. 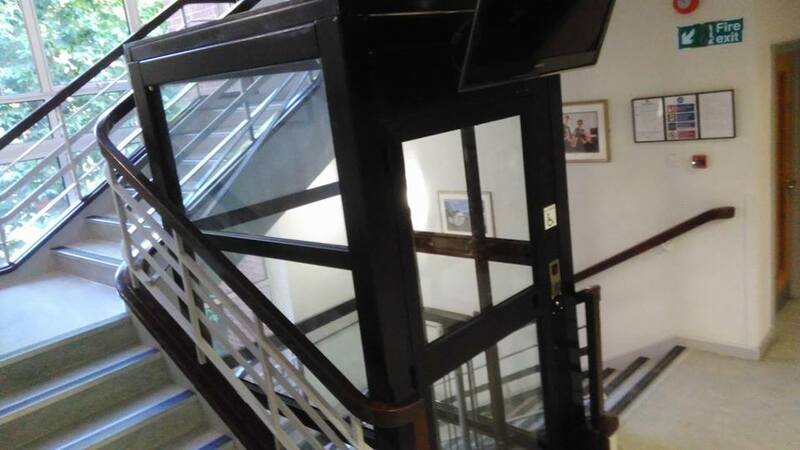 Platform lift installation Dating back to 1785 and teaching over 25000 students queen Mary college is ranked in the Top five universities in London. KEP lifts engineers recently carried out an installation as part of a wider development of the grand and historic entrance lobby. New Inclined Platform Lifts in Kent, Sussex and Essex. KEP lifts is proud to have installed a large number of Supra Inclined platforms across Kent, Sussex and Essex so far this month making KEP Lifts a leading inclined platform lift company within the UK.. Inclined platform lifts allows for disabled access via a stairway. Due to the rail construction, inclined platform lifts are suitable for almost any type of staircase both indoors or outside. Our recent installations have been in schools, care homes and in a new apartment complex. Advantages of owning a Inclined Platform Lift. All inclined platform lifts installed by KEP have simple controls that are clear upon use. in addition to this KEP engineers always give a full tutorial on use on any completed installation. Safety is built into all products installed by KEP Lifts - your safety is our number one concern. All inclined platform lifts installed by us have a number of features to ensure that obstructions can not cause harm to the passenger or others. Safety barriers also raise to assist the passenger in travel. Inclined stair lifts make for excellent value - often cheaper than other forms of lift when covering the same distance. See below for pictures of other brands of inclined platforms recently completed by KEP Lifts such as the Hiro inclined Platform lift. Open Aspect Platform Lifts (often referred to as disabled access lifts) offer travel from just a few steps to several metres. 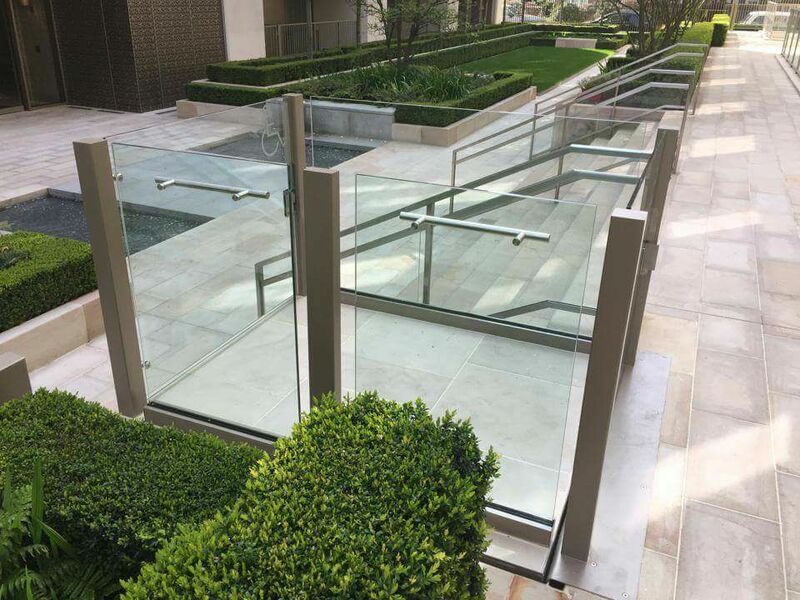 Often seen in building entrances both internally and externally these lifts allow for easy access for all. 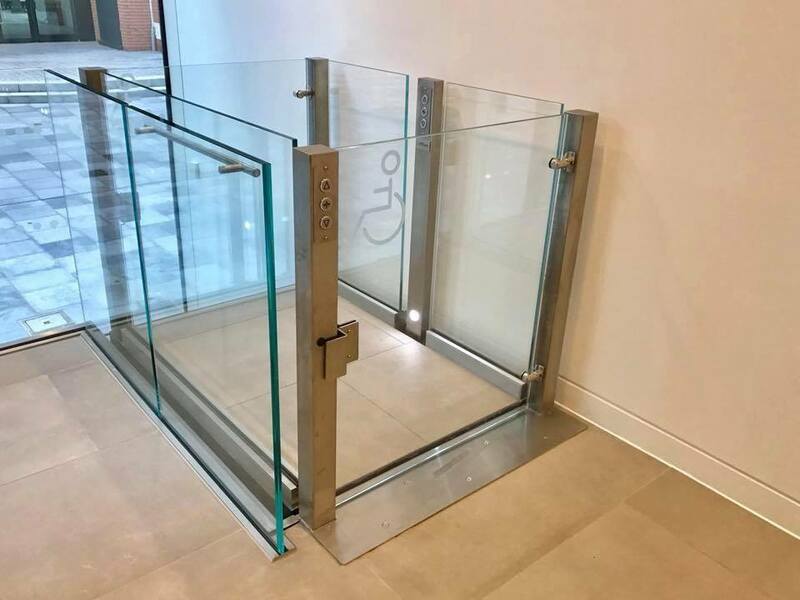 Above shows a stunning example of a Mylyft platform lift installed in the City of London. 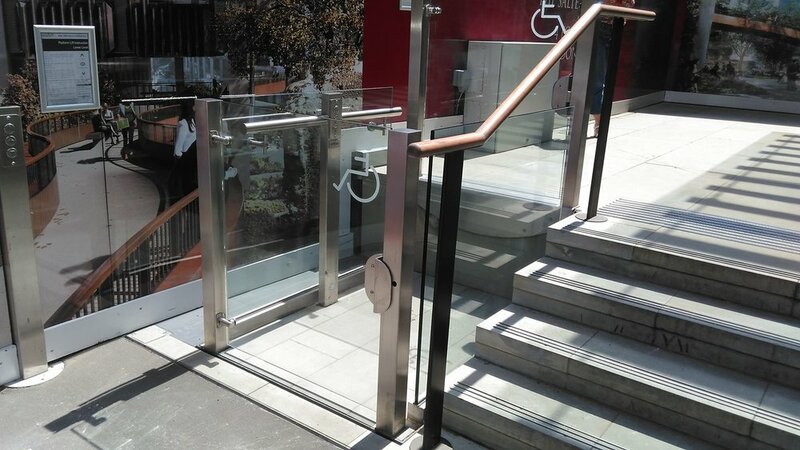 Located next to stairs, this lift provides equal access to all. The lift shown is capable of transporting multiple passengers at once, including a wheelchair user and assistant. KEP Lift engineers have a long history in the platform lift industry. With this expertise we have selected only the highest quality of brands. offering unparalleled reliability, style and efficiency - while remaining competitive on price. For more information on open aspect platform lifts - or any other form of platform lift. Please visit the link below. KEP Engineers work across the country on lift installations, lift removals, lift servicing or Lift repairs. This blog shows a few examples of the work undertaken by just one of our teams covering Brighton and its surroundings. KEP Engineers were called in to inspect and repair a stairlift - Reliable for many years, this stairlift had minor issues that were fixed promptly by our engineers. KEP Lifts installs, maintains and repairs stairlifts across the country. Next up our engineers were called into visit a Orion vertical platform lift for a routine service - The Orion and Gulliver vertical platform lifts offer a stylish, reliable and affordable solution to all of you lifting needs. As visible from the image attached, the appearance of the lift resembles that of a passenger lift (There are many other appearance options all shown in our brochure). However the speed to install, lower required pit depth and cost to buy are all that of a platform lift - making these lifts ideal for homes and businesses alike. KEP Are your local dealers of Orions & Gullivers - Please view our vertical platform page for more information. The team of engineers final job of the day was a visit to a Supra Inclined Platform Lift installed by KEP Lifts three years ago. 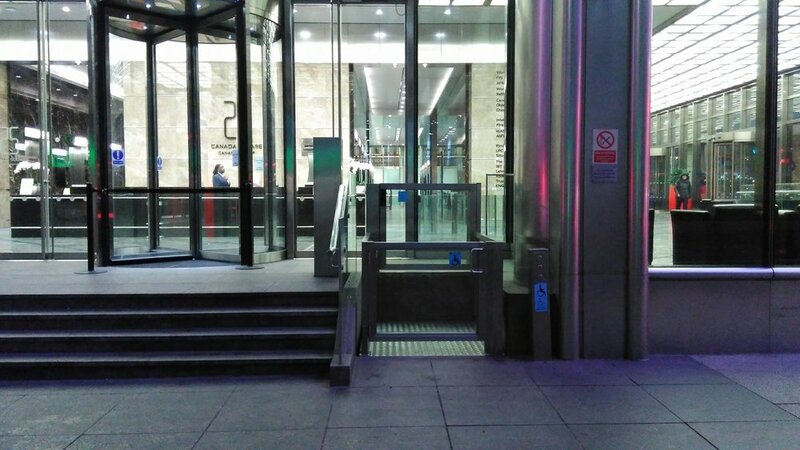 These lifts have proven themselves to be a reliable addition to the building in which they belong, providing disabled access across all levels of the building. 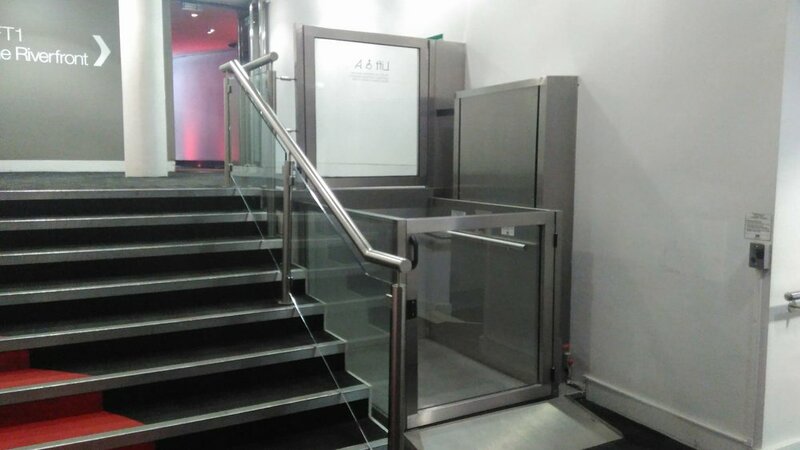 Inclined platform lifts allows for disabled access via a stairway. 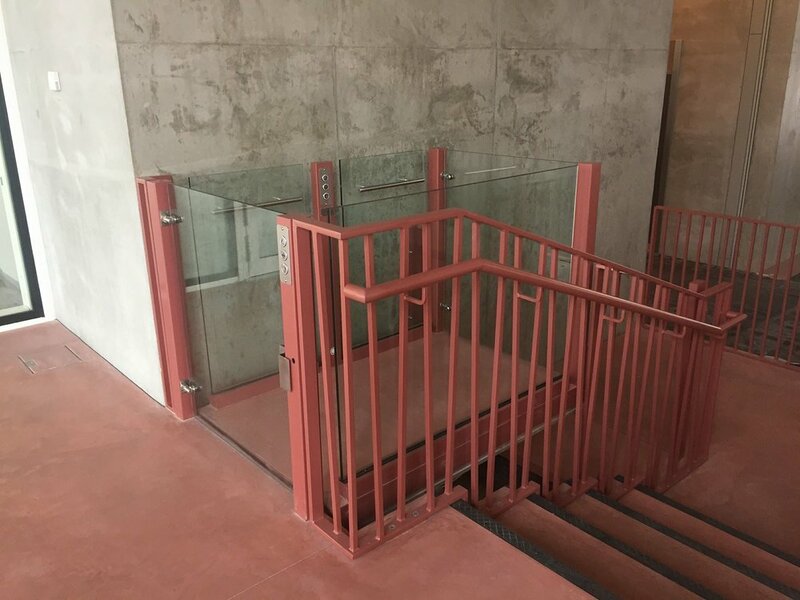 Due to the rail construction, inclined platform lifts are suitable for almost any type of staircase both indoors or outside. 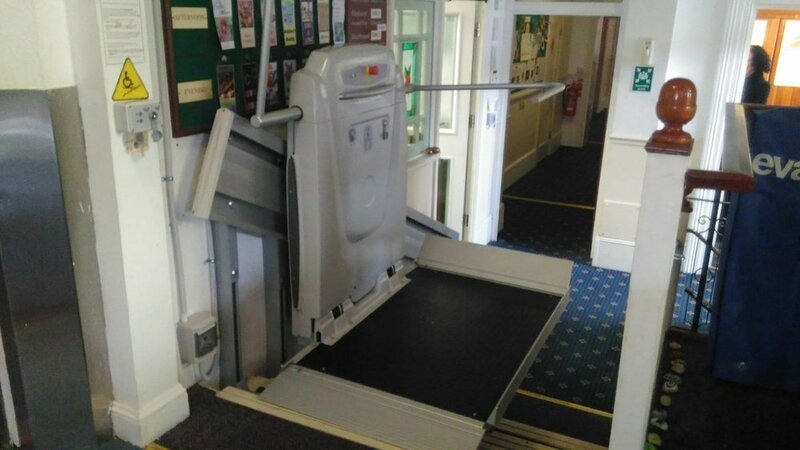 Inclined stair lifts make for excellent value - often cheaper than other types lifts when covering the same distance. KEP installed a total of six platform lifts in the home of Manchester United football club! The installation was carried out by multiple teams of KEP engineers allowing us to complete the entirety of the works in under a week. 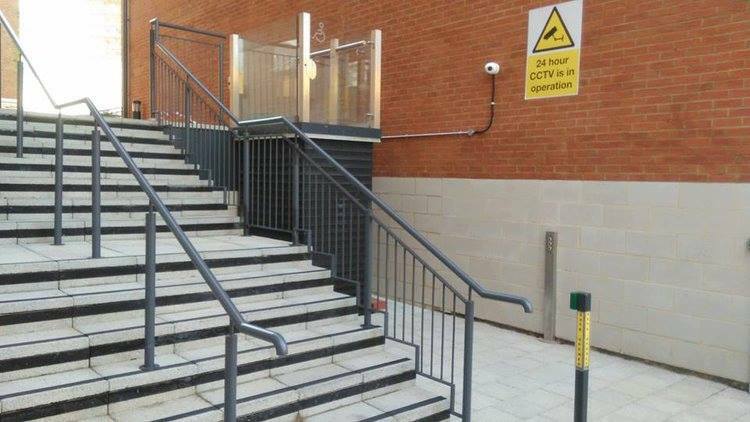 The works being carried out by Manchester United will allow for an additional 300 disabled seats. The lifts installed by KEP have been designed specially by the architects and lyfthaus to meet the unique stadium environment. 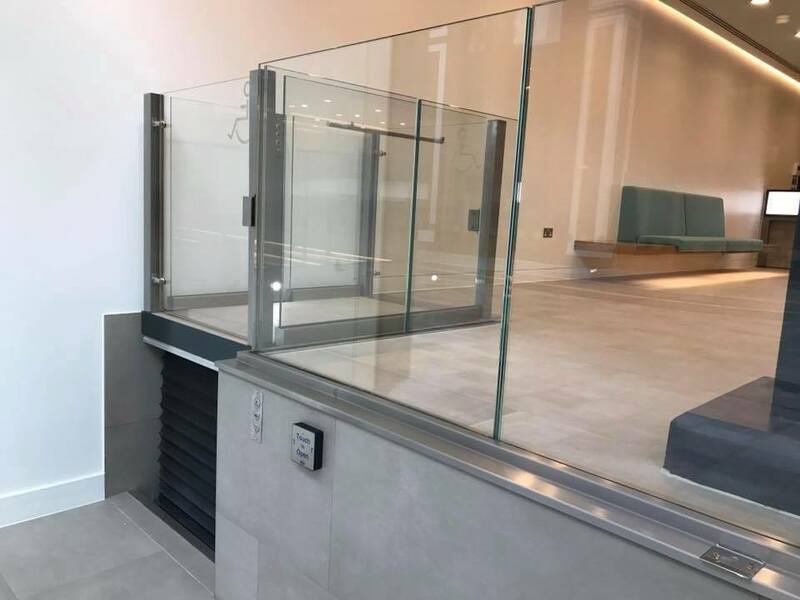 Another lift installed by Kent Elevators and Platforms Ltd is located at the enterance of The Old Marylebone Town Hall, London. Part of the London Business School. This building has a proud history and is where celebrities such as former Beatles Sir Paul McCartney and Ringo Star, Oasis frontman Liam Gallagher and Hollywood stars Antonio Banderas and Melanie Griffith got married. The platform installed by KEP will allow for access down into impressive modern entrance that interconnects the two grand and historic buildings. 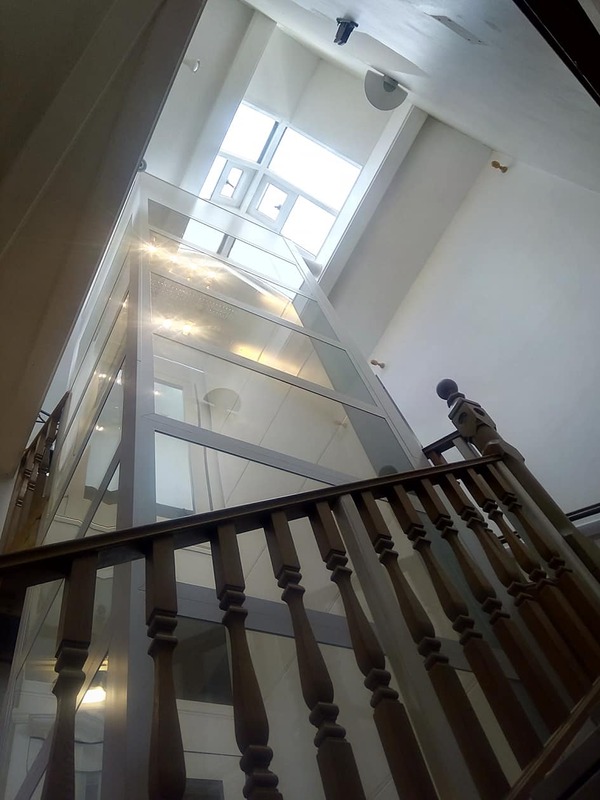 Located within the picturesque church, this lift has been custom designed and installed with the building in mind - the results can be seen for themselves! KEP engineers were all left speechless on first arrival at this job - the stunning church and its surrounding ruins makes for a excllent day trip to any one in the area. KEP Lifts has just gone through an extensive vetting procedure which now means we are officially Kent trading standards approved. KEP always endeavours be professional, friendly and reliable - trading standards approval is an accreditation we hope showcases our working ethic. KEP Lifts can now also be found on Checkatrade.com - Our presence on here means that our customers can see genuine reviews by our most recent customers. You can of course still find all the most upto date images, news and contact information right here on www.keplifts.co.uk! KEP Lifts - Summer news 2017! KEP lifts is continuously looking to help and improve our local community. As part of this our engineers have volunteered to maintain a local roundabout. Pictures to follow of the new look roundabout in the coming weeks! Helping our local community is important to all of us at KEP Lifts - as well as maintaining a local roundabout we are sponsoring a local youth football club as of this year. KEP Lifts is proud to have worked in some of the most iconic buildings and iconic lifts within the UK. 2017 sets to continue this trend with our engineers already having completed lift installations in the Cheltenham festival, Royal Ascot, Queen Mary University, Canary Wharf, Battersea Power Station and Selfridges - Just to name a few! Of course this is not including the large amounts of private residences that we are equally proud to work within all around the country. KEP Lifts are pleased to announce another successful installation of a platform lift - This time inside the stunning Queens building within the Queen Mary University of London! 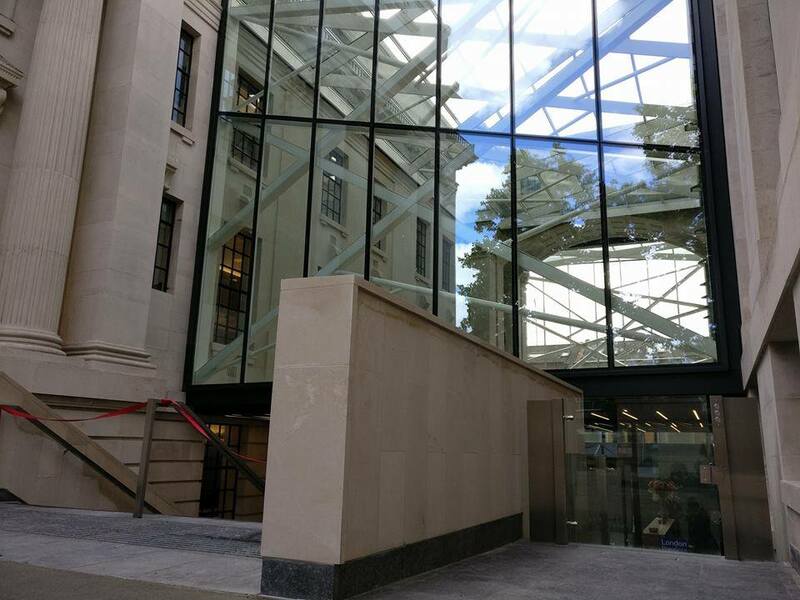 Installed was an open aspect platform lift designed to the architects vision - this lift compliments and does not take away from the impressive, historic space in which it resides. Would you like to know more information on Platform lifts? Kent elevators and platforms Ltd (KEP) is pleased to announce the completion of another lift installation. This time is of a goods lift in Rathone square, Central London. Rathbone square is one of the first public squares created in London in over 100 years – comprising of 142 luxury apartments complete with access to a swimming pool, Private wine storage room, private cinema and gym. Along side this is 216,000 feet of office space and a collection of shops and restaurants. Installed by KEP is a IMEM goods lift with a maximum load of two tonnes – Providing a quick, safe and effective ways of moving goods around the building. KEP engineers are experienced in the installation of IMEM lifts – Check out our recent Ramsgate, Kent installation for pictures of an IMEM passenger lift. KEP also offers finance options on all our lifts, please ask our office for more details. KEP would like to thank everyone at Rathbone square – on completion it will make a fine addition to central London. For more information on the Imem boxlift - click here to view their brochure. KEP is pleased to announce the installation of a lift at Battersea power station! We installed a vertical platform lift providing step free access between two floors for the residents of Battersea power station. Installed is a Gulliver by Thyssen Krupp – KEP is your local registered dealer of their products. We highly recommends their lifts for vertical platforms as well as stairlifts. As with all installations carried out by KEP, a guarantee and a years free servicing come as standard - finance options are also available. Battersea power station is being turned into luxury accommodation, shops, offices, parkland and more! One of the largest sites in Europe, the transformation of this part of London is on a truly awe inspiring. Visit https://www.batterseapowerstation.co.u for more information on this amazing project. Another update of another lift installed at battersea will follow shortly. For more information on vertical platform lifts, or any other type of life. Contact our office today! Yet another completed lift installation by KEP Lifts. This time in Old Street, London. The lift installed was a Lyfthaus step lift - designed to fit in with the new impressive building in which it is situated. All our lift installations come with a guarantee on parts and have a years free servicing as standard. We offer finance options on all our lifts. We offer free advice and its always 100% no obligation. KEP carried out a routine servicing at Greensmiths food company. Greensmiths provides artisan bread and dairy produce and farm-to-plate butchers, plus cafe. they have two lifts, a platform lift as well as a dumbwaitor that are maintained by KEP Lifts. The dumbwaitor is used for plates of food to be transported from kitchen to their cafe (we recommend a visit!). For more information on Dumbwaitors or Platform lifts - contact us today. KEP have just completed another repair - This time on a lift in Kent. White Cliffs vets in Whitfield, Dover has recently moved location to a bigger surgery. For the comfort of the animals and staff the building has a Concord platform Lift. This allows easy comfortable access for the animals that are being treated. KEP would like to thank the friendly staff and caring atmosphere that the surgery holds. We highly recommend if you are local to the Dover area. Do you need a lift repaired, installed or removed? Contact KEP Lifts today. For more information on Platform Lifts - Please view our resource pages. KEP is delighted to announce that we have completed a passenger lift in kent for the Sir Stanley Grey pub in Pegwell Bay. Our engineers fit a three stop Imem silence pro to provide access from the clifftop level entrance down through function floors to the ground floor at sea level. We would like to thank all the staff at the Pegwell bay hotel and the Sir Stanley Grey pub for their hospitality. The building has great food, atmosphere and views that simply cannot be beaten. If in the area we highly recommend a visit! Interested in having a passenger lift for your home or business? For more information on passenger lifts please click here. Kent Elevators and platforms installs many lifts in Kent - KEP is a national business, servicing all corners of the UK. Where ever you are in the UK, Contact us for a no obligation quotation.